Twin Speak:DressCode: Jane Fonda Under Arrest! This is Jane Fonda wearing a t-shirt with a Jane Fonda circa 1970 mugshot at which time she was arrested on suspicion of carrying drugs. Turned out they really were vitamins! Just like she said! Maybe we should make T-shirts with our own mugshots a fashion trend! Barbara and Phoebe get arrested all the time for having way too much fun to be engaged in legal activities. LOL! Here Ms. Fonda is suspected of carrying a dog! Is that a live animal? Not sure since the dog was ignored in your coverage. 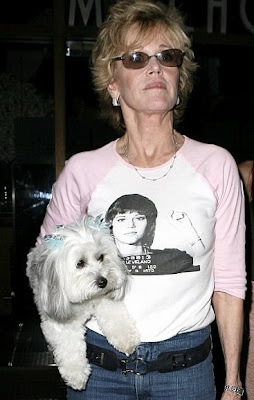 Ms. Fonda is not alone in the photo in her mugshot tee-shirt. There is Another live thing in the photo. You know some people say their dogs are part of the family. Would you not identify Ms. Fonda's daughter if she were holding her? Please, in the future, acknowledge and identify both celebrity and every day dogs that you and Barbara portray with your celebrities.